Mountain Weather: Snowfall Playing Catch-up and Gaining! Snowfall Playing Catch-up and Gaining! We have had a lot to make up for with snowfall this winter, with a slow start to the season. Snow storms have been fewer and farther between than last winter, but this past week's snowfall has almost caught us up to where we should be this time of year. It has generally been a feast or famine cycle for powder this season, with three good stormy periods that stick out: one around New Year's, one the third week of January, and now this one during the second to third weeks in February. We are just past the mid-point of the Winter Season now, and maybe we can relax a little as settled snow depths are now very close to normal for this time of year in the mountains, thanks to the snow of this past week. As as you can see in the table below, we're not grossly behind where we were last year at this time, for settled snow depths. Between Valentine's Day and Washington's Birthday there has been about 4 feet of new snow at the higher elevations. Rendezvous Bowl had 44 inches and the Raymer Plot had 48 inches. Distribution was a little askew when comparing these two stations at roughly the same elevation, during the first half of this past week (Feb. 14 to 20) Rendezvous Bowl had 20 inches of snow and the Raymer Plot reported 15 inches. During the second half of this past week (Feb 21 to 23) Rendezvous Bowl showed a total of 22 inches of new snow and the Raymer Plot recorded 33 inches of snow. Not to shabby for February, which is usually the driest month of the winter, on average. It was also VERY windy during this period, with 30 to 39 mph sustained winds in the valley and gust to 55 mph. In the mountains averages were sometimes between 40 and 50 mph with gusts near 80 mph in the Teton Range. The jet stream was right over head Wednesday evening when winds were at their peak, and estimated to be between 130 and 150 mph at 30,000-ft.
We are still behind on our season total snowfall numbers and nowhere near where we were last winter. See comparison table below. Snotel Reports also indicate that the Snow Water Equivalent (SWE) is now at 92% of average. So it is looking like the middle part of winter is proving to be the fattest, as far as snowfall goes. The best news for Jackson Hole skier's is, that we are still looking fatter than much of the rest of the Western United States. 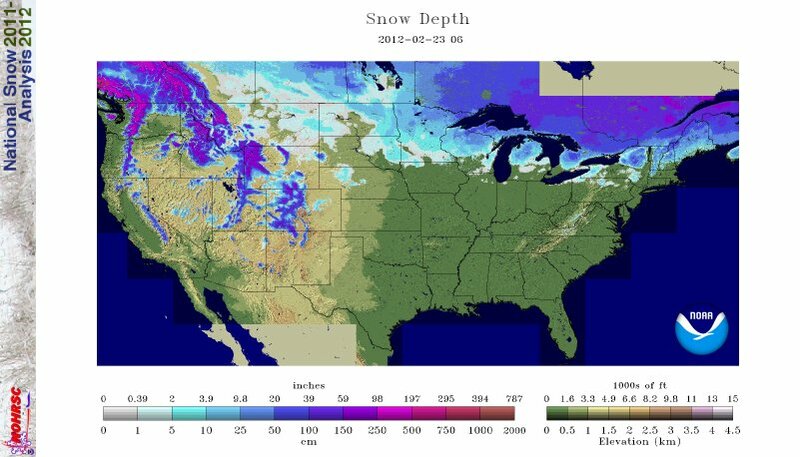 (See National and regional snowdepth maps below, as of Feb. 23, 2012.